Nafion 112- The "membrane" of Proton Exchange Membrane, a thin flouropolymer that will allow the hydrogen proton to pass through. This will give off 1 free electron, 50% turning into electricity, 50% turning into heat. (Assuming 50% efficiency.) The surface of the Nafion contains a platinum/carbon catalyst to increase current densities. Carbel Gas Diffuser- This allows a pocket of hydrogen and air to be against the membrane. They are also coated with a platinum powder to act as a catalyst and speed the reaction process. 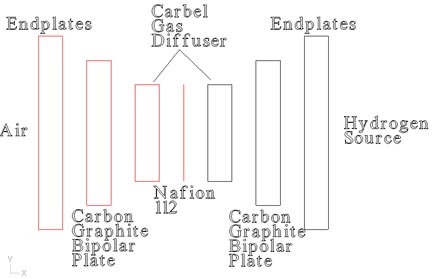 Carbon/Graphite Bipolar Plates- The carbon/graphite provides a conductor that is inert in its chemical properties, and will withstand the environment of the fuel cell. The bipolar plates are simply the "wire" to get the electricity out of the fuel cell. Endplates- These contain the necessary plumbing to get hydrogen into and out of the fuel cell, and provide structural support for the carbon graphite plates. The endplates contain the contact points between the fuel cell and the electrical load. Hydrogen- The PEM fuel cell is not free energy, it requires a constant fuel source. Bottled hydrogen is best for small portable fuel cells. Larger fuel cells require a reformer, a device which will take a hydrocarbon fuel such as propane, natural gas or gasoline, and chemically convert it into a hydrogen rich feedsource. Hydrogen can be thought of as a "molecular battery", each H2 molecule contains 2 extra electrons, and that stored energy is converted inside the fuel cell to electricity and heat. Air- The air around us is a sufficient source to supply oxygen to the fuel cell. There is no tank space required compared to a pure O2 feed, and the mechanical design aspects of a pure O2 feed add to the complexity and cost of the fuel cell. For any questions on the operation of a PEM fuel cell, and the availibility of our fuel cell components, please e-mail us.